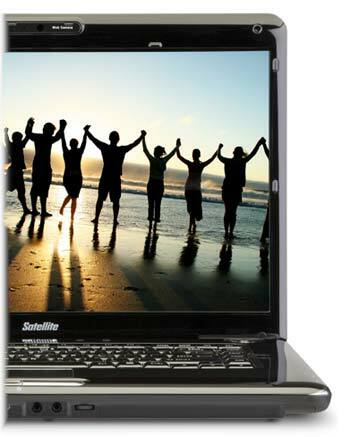 Toshiba Satellite A355D-S6921 Notebook PC The Toshiba Satellite A355D-S6921 Notebook PC is versatile, affordable and equipped for fun and entertainment. Topped by an attractive Fusion? 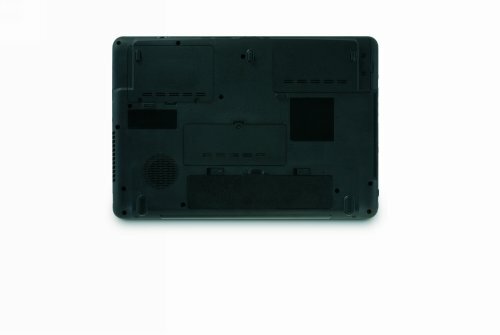 Finish with Constellation Black pattern, this laptop still has the memory, storage and processing power that add up to great performance ideal for helping you handle your busy life. Yet when the day's done, it's also ready to play, offering an AMD Turion? 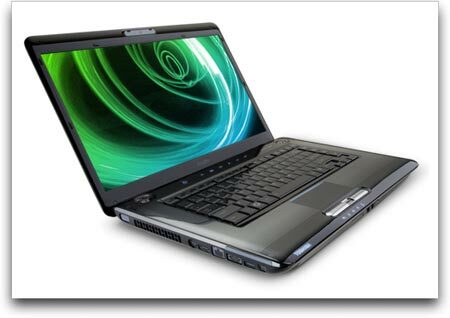 X2 Dual-Core Mobile Processor RM-70, 3GB DDR2, 250GB (5400rpm) hard drive, and a brilliant 16-inch diagonal display for more memorable movies and photo editing. Coupled together with features like a Webcam, USB Sleep-and-Charge and a high-definition sound port stay productive while you travel. Replace your desktop PC with the Toshiba Satellite A355-S6921 laptop, featuring all the power and hard drive space you expect from a top-of-the-line desktop but in an easily mobile package. Stylishly designed, this Toshiba Satellite features a large, bright 16-inch LCD (1366 x 768)--with a true 16:9 aspect ratio and 720p native high-definition resolution. It's also great for using as a media center, with Toshiba's Express Media Player enabling you to bypass the system and access CDs and DVDs with a touch of button. The dual-layer DVD¡ÀRW drive also burns CDs and offers LabelFlash print functionality. A 1.3 megapixel digital web camera built into the LCD's bezel lets you quickly snap photos and participate in live video chats. 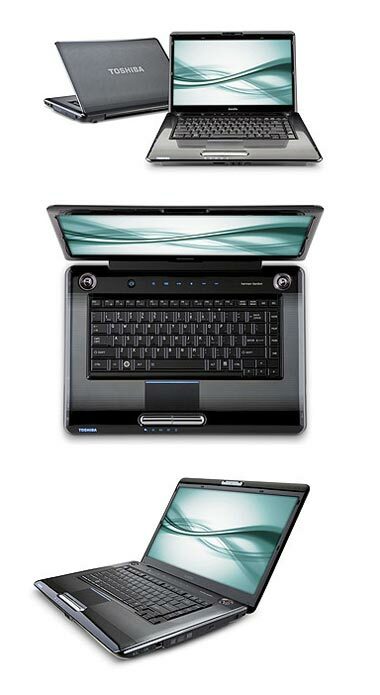 It offers dual-core productivity from its 2.0 GHz AMD Turion X2 RM-70 processor. Other features include a spacious 250 GB hard drive, 3 GB of RAM (4 GB maximum), 5-in-1 memory card reader, Draft-N Wi-Fi networking (802.11a/b/g/n), ATI Radeon 3100 graphics (with up to 1919 MB of dynamically shared video memory), Draft-N Wi-Fi networking (802.11b/g/n), and Toshiba's Fusion finish with Horizon pattern. Processor: The 2.0 GHz AMD Turion X2 RM-70 processor offers a dual-core architecture, which delivers additional computing resources to help expand your PC¡¯s capabilities by providing higher throughput and simultaneous computing--increasing your performance by up to 80 percent. You'll be able to perform multiple tasks such as digital rendering and gaming all while running virus scan or other background tasks seamlessly thanks to the innovative Direct Connect Architecture. And it's designed to handle simultaneous 32- and 64-bit computing with no degradation in performance. You'll enjoy long battery life thanks to the AMD PowerNow! power management technology, which delivers performance on demand and can extend system battery life up to 65 percent. And the AMD Digital Media XPress technology delivers stellar multimedia performance and playback on digital entertainment such as games, streaming video and audio, DVDs, and music. Memory: The 3 GB of installed RAM (PC6400, 1 x 2 GB, 2 x 1 GB) helps boost the amount of available video RAM that's shared with this notebook's video card. It also offers an ultra-fast 800 MHz speed. This notebook has 4 GB maximum RAM capacity. To receive the faster data transfer benefits of the dual-channel DDR2 RAM, any RAM additions require memory modules of same capacity and clockspeed. This package contains the Toshiba Satellite A355-S6921 notebook PC, rechargeable lithium-ion battery, AC adapter, and operating instructions. It is backed by a one-year limited hardware warranty.